In honor of Intellectual Disability Awareness Month, Vocational Rehabilitation shares the story of an employer’s first experience working with a person who has an intellectual disability. Nhat — who has a depressive disorder and a mild intellectual disability — found the position at Homewood Suites with the assistance of Vocational Rehabilitation (VR), a state agency that helps people with disabilities get or keep jobs. VR also provided a job coach, Lee Garcia, to help Nhat learn how to be successful at work. On his first day on the job, Lee went with Nhat to the hotel to check out where he would be working, learn what his job duties would be, and talk to his bosses. Lee also helped Nhat throug his first two weeks of training, where he learned how to clean the rooms within a time limit. 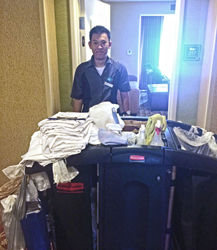 Nhat has since used the experience he gained at the hotel to pursue two new job opportunities. He currently works in the deli at Wal Mart in Tampa and in goundskeeping at Busch Gardens. “I love both jobs,” he says .